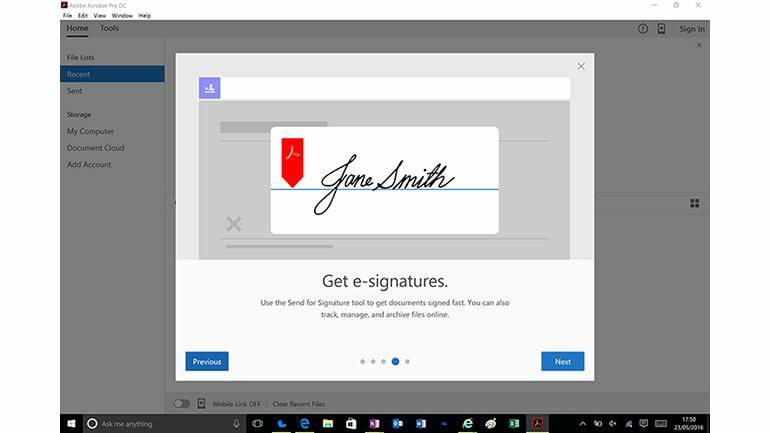 Adobe EchoSign is the electronic signature solution you can trust, from the company that brought you PDF and Acrobat. 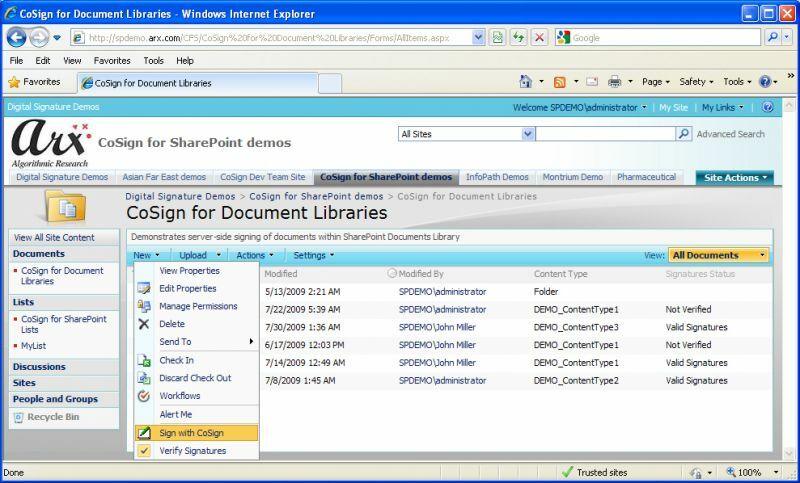 Organizations of all sizes rely on it to get documents signed and close business—easily, securely, on any device. The Most Secure and Top Rated eSignature Solution for Business. SignNow cuts document turnaround time by as much as 90%. 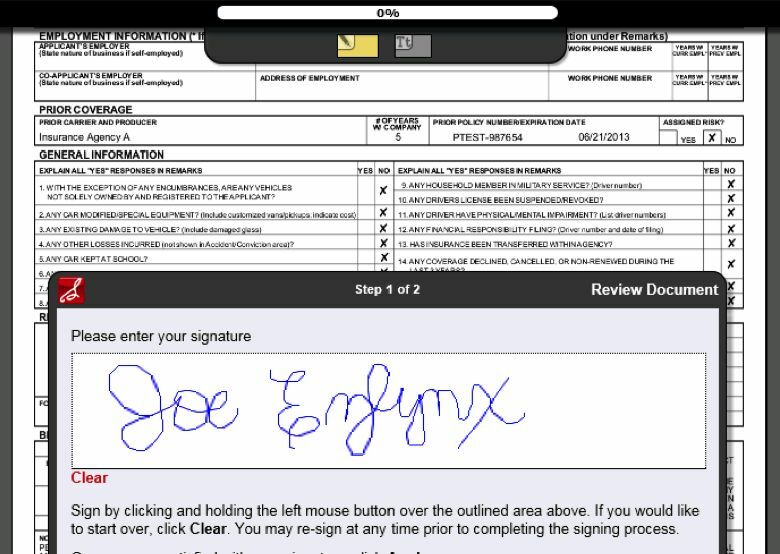 Get legally binding signatures from your customers, partners and employees in seconds using any device. Never search for a signed paper agreement again. Gain control over your document workflows, electronically secure your critical documents and easily integrate with other systems. 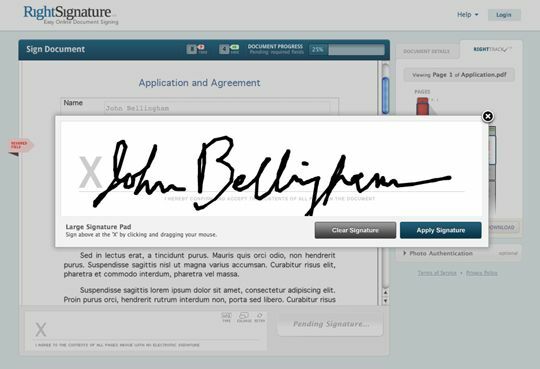 HelloSign's secure electronic signatures are business-caliber, easy-to-use, and legally binding. Getting documents signed has never been simpler. 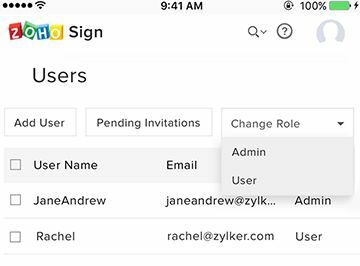 We've removed paper entirely from the process and built tools to facilitate document signing, tracking and management. 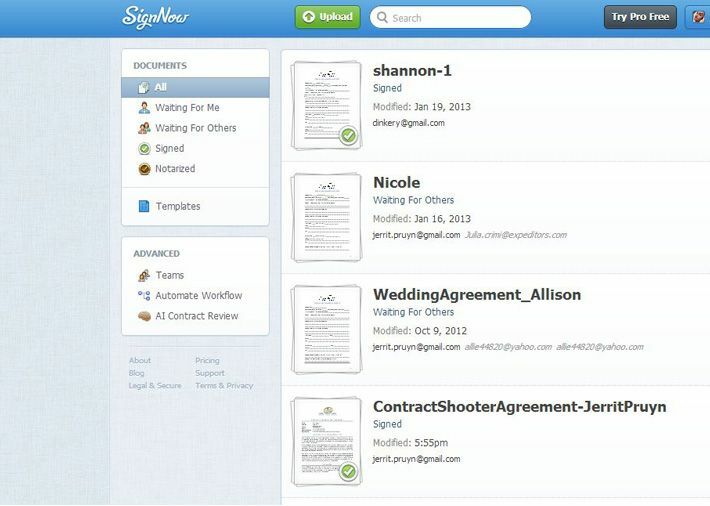 Notifications keep you apprised of the signer's activity and our audit trail logs it. Once completed, signed documents are securely stored and accessible from the cloud so you can always get to your important documents. The easiest, fastest way to get documents filled out and signed online. Use Your Existing Documents. 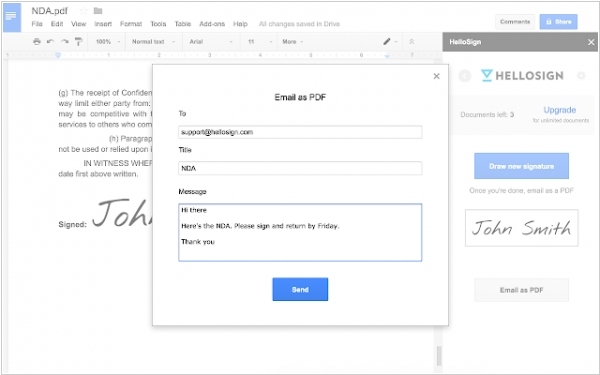 Upload a PDF, Word DOC, or many more Enable your customers to e-sign documents while traveling. Obtain electronic signatures in person. SignEasy’s simple, easy-to-use, yet powerful electronic signature solution helps individuals, professionals and businesses to expedite paperwork, save costs and be more productive. Complete digital signature app for business. 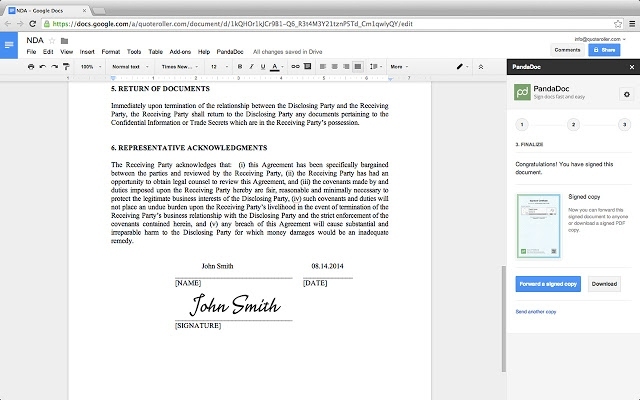 With Zoho Sign, you can carry out the entire signing process from the cloud and seamlessly close deals in minutes. 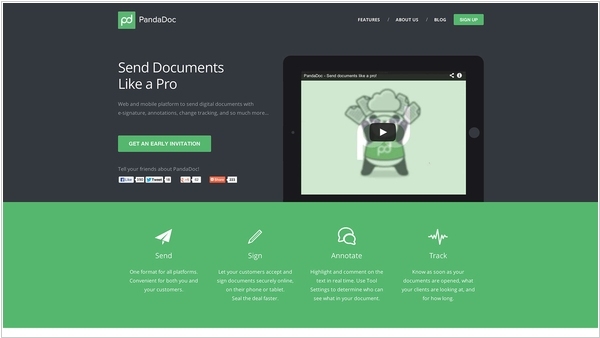 PandaDoc helps you simplify and speed up your paperwork process. All-in-one software to create, deliver, and manage your team’s quotes, proposals, contracts, and other sales collateral. Create beautiful contracts. Get secure electronic signatures in minutes. Millions of signers at businesses, governments and cloud vendors around the world are already using CoSign, the only cross-enterprise digital signature solution that ensures trust, integrity, control and security for paper-free processes throughout the business environment. eSignLive is the world's largest and most experienced e-signature software provider. Visit us online and find the right online digital signature solution for you. No matter how simple or complex your signing processes are, whether you need to e-sign the occasional electronic contract, or you are planning on processing tens of thousands of transactions online, you won’t have to compromise with eSignLive. You’ll get exactly what you need at a price that suits your budget. AssureSign Electronic Signature Software is the leading web-based and on-premise e-signature solution, enabling users to obtain document authorizations. MyDoX is perfect for small and medium-sized businesses who want to start getting documents signed online right away. You can access this cloud-based software on any computer or mobile device. There’s nothing to download or install, so implementation is quick and easy. 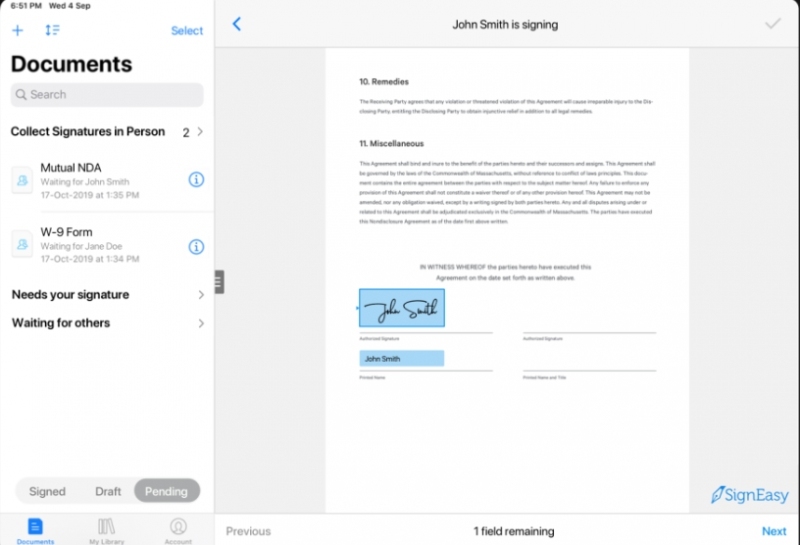 Dropbox is to acquire for $230 million HelloSign, a company that provides lightweight document workflow and eSignature services. This can also been seen in the context of the Extension capability that Dropbox added last year. HelloSign was actually one of the companies involved at launch. While Clark says the company will continue to encourage companies to extend the Dropbox solution, today’s acquisition gives it a capability of its own that doesn’t require a partnership and already is connected to Dropbox via Extensions. Dropbox is going to remain HelloSign as a standalone business within the Dropbox family. 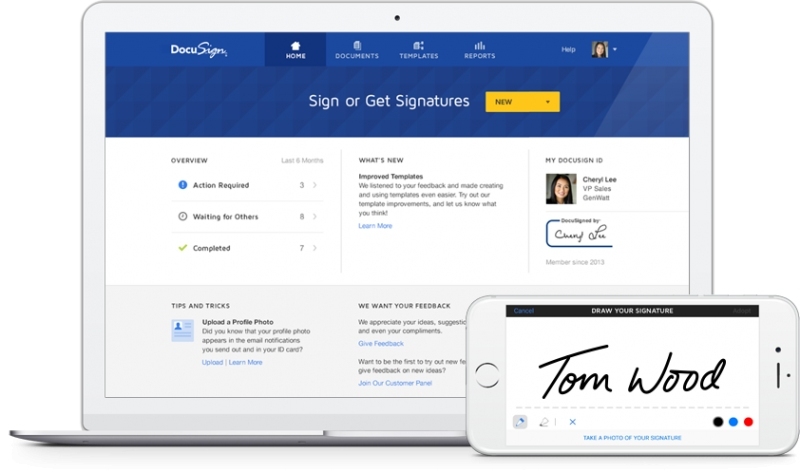 DocuSign, which pioneered the e-signature, is gearing up to go public in the next six months, sources tell TechCrunch. Utilizing a commonly used provision of the JOBS Act, DocuSign submitted its IPO filing behind closed doors and will reveal it weeks before its public debut. Like Dropbox, which is finally going public this week, San Francisco-based DocuSign has been an anticipated IPO for several years now. It’s raised over $500 million since it was founded in 2003 and has been valued at $3 billion. Kleiner Perkins, Bain Capital, Intel Capital, GV (Google Ventures) and Dell are amongst the many well-known names which have invested in DocuSign. 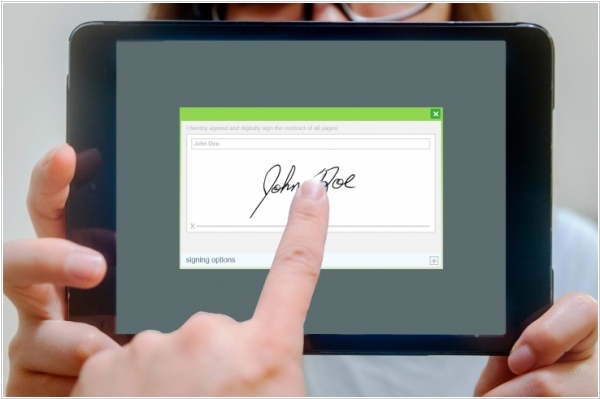 Zoho introduced new service - Zoho Sign – a complete digital signature app for business, that enables to carry out the entire signing process from the cloud and seamlessly close deals in minutes. Zoho Sign integrates readily with other Zoho apps such as Zoho CRM and Writer and works with your daily apps, including Google Drive, Dropbox, Box, and OneDrive, making it easy to sign contracts anywhere and keep your deals moving forward. This new addition to the Zoho suite is perfect for large enterprises and SMEs and can be used across industries like finance, construction, manufacturing, real estate, and healthcare. 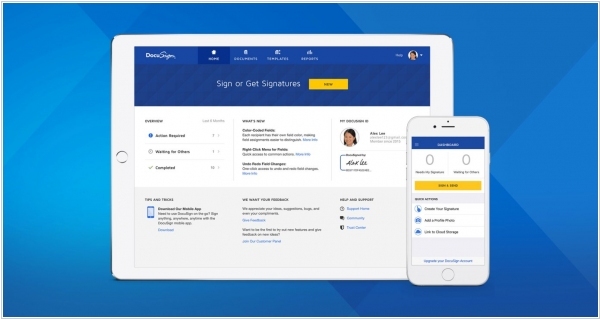 Electronic signature provider DocuSign is now allowing users to add a payment to be collected digitally at signing. This is particularly important for contracts that require a down payment to continue. Prior to having this capability, the parties would have to arrange payment separately from the electronic contract signing process. For many businesses like contractors or event rentals, this meant having to make a phone call or sending an email or snail mail bill to collect payment before work could begin or the deal was official. With this new payments functionality, the parties can arrange payments up front and streamline the entire process. PandaDoc, the startup that helps automate creation of quotes, proposals and contracts has announced a $5 million investment. The product is essentially a content layer that sits on top of your CRM tool. Currently it’s compatible with Salesforce.com, Zoho, Pipeliner and Base. It also works with Zendesk to enable customer service personnel to send out renewal contracts and other information. When sales personnel have to create content for their customers, they can choose from a series of pre-defined templates that have been customized for the company. One template might be standard introductory matter, another could be a pricing table with standard discounts.